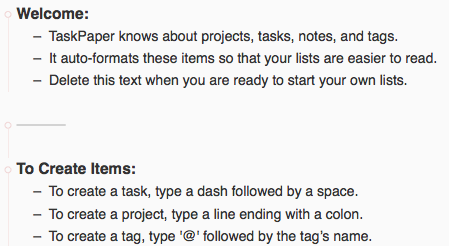 In the previous version of TaskPaper, we were able to add horizontal dividing lines to the styling of top level tasks. Any chance we could get this feature back? I have looong lists, and the visual break-up helped immensely. 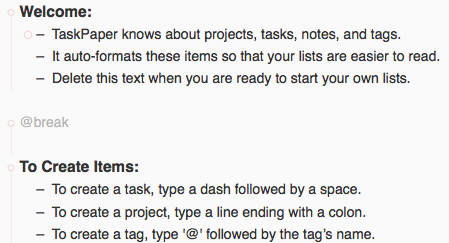 I do expect to add more styling options (including horizontal dividers) eventually. Not sure when, but it’s on my list. Horizontal dividers were such a small thing, but something I used all of the time. They would really be helpful once implemented. Chad, I just tried it and while it may not be as good as a divider, it does work pretty well! Thanks for the tip. That’s thinking outside the box. Coming back every few months to bump this. I have the old TaskPaper on my home Mac, and it looks so much cleaner with dividers. A small thing, but would make us OCD types happy! A makeshift solution for this is to use a unique “divider” tag with custom styling.